Few heroes of film and literature have had the long lasting legacy that the prince of thieves has had. Robin Hood’s origins date back to medieval times, possibly even beginning from the exploits of a real person. Though his historical roots may be disputed today, the legend of Robin has not diminished over time. For many, Robin Hood is the quintessential freedom fighter; a person who works against the system in order to solve an injustice. And that distinction has made him a very commonly reinterpreted image of heroism. Really, he represents many different things to different people. He’s a rebel, an activist, and a noble protector. In the world of politics, conservatives view him as a hero who stands up against big government overreach, while liberals view him as a hero who re-disperses wealth from the rich to the poor, both fitting that mold of righting injustices. And perhaps the most interesting aspect of Robin Hood’s character is his selflessness, which is something that has helped him earn almost universal admiration. 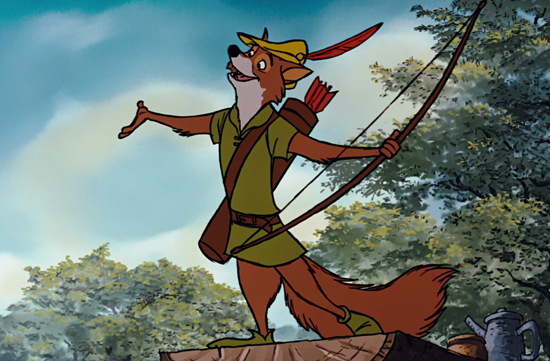 In most versions of his story, Robin Hood is a nobleman who gives up his title and lands in order to achieve social justice outside of the law, which he views as corrupt and illegitimate. The main story of Robin Hood is set during the post Norman invasion years of English history, where the native Saxon people were at odds with their Norman overlords. Robin of House Locksley sees the dishonesty in the rule of Prince John, who’s using taxation as a way to oppress the Saxon people, and he uses his expertise as a knight and an archer to subvert the usurper king, and restore the throne to the more just King Richard, who is returning home from the Crusades. It’s Robin Hood’s nobleness that defines him in his tale, but at the same time, most interpretations also build up the charming playfulness of the character as well. There’s a reason why Robin Hood and his band of outlaws are known as the Merry Men. He is both a crusading hero as well as a romantic one, which has endeared him to readers and audiences for centuries. And that specific aspect is what has made him an ideal character for the silver screen. Robin Hood has enjoyed many cinematic variations, some of which have left their mark on the character for modern times. Even with reinterpretations, the essential aspects of the character and his story have remained mostly unchanged. In each film, Robin steals from the wealthy and gives to the poor; he woos the beautiful Maid Marian; and he restores Richard the Lionheart to the throne bringing peace and prosperity back to the land. Interestingly, the most common thing that changes from each different film version is Robin Hood’s ultimate nemesis. Usually, it’s a choice from one of the story’s three central villains; the conniving Prince John, the ruthless Sir Guy of Gisbourne, or the thuggish Sheriff of Nottingham, but almost never all three in the same film. Sometimes one of those characters is written out entirely, leaving more time to focus on one or the other. But, what always ends up being the highlight in each movie is Robin Hood himself, and Hollywood has given us many spectacular and varied versions over the years. Like other articles in this series, I will be looking at a few of the most notable versions of the character on film, and see how Robin Hood has evolved over the years as an iconic screen hero. Of course, we start with the man who effectively became a legend playing the character. Douglas Fairbanks was arguably Hollywood’s first matinee idol, and the role of Robin Hood is certainly what helped to cement his image. What Fairbanks brought so effectively to the character was the fearlessness. In the film, Robin Hood must accomplish many death-defying feats in order to save his love Maid Marian from the diabolical Sir Guy of Gisbourne. What is particularly special about all the spectacular heroic feats in the film is that Fairbanks did most of them himself, without a stunt double. The early days of Hollywood allowed a bit more leeway with what actors and filmmakers could get a way with, and that suited Fairbanks just fine because he was a bit of a showoff, which comes across in his performance. He’s gutsy, but at the same time debonair, and he brings out every aspect of the character perfectly, despite the restrictions of silent cinema. His leaping jump from a galloping horse on a raising drawbridge, without the help of visual effects, is a particularly spectacular feat to watch in the movie. Fairbanks also set the standard on the visual representation of the character, with the pointed cap and the neatly trimmed facial hair. Indeed, that look would define the character throughout most interpretations in the years ahead. It’s a movie that clearly proves that Robin Hood was tailor made for cinema, and it took an actor of Fairbanks’ caliber to pull it off. 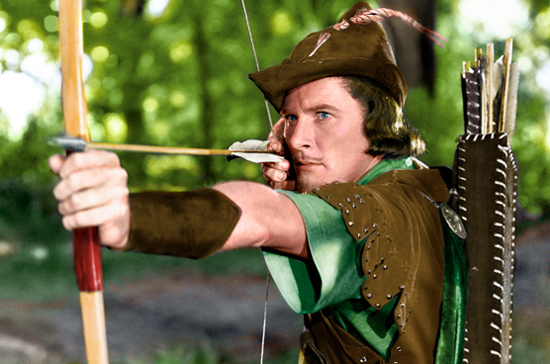 What Robin Hood needed was the swashbuckling treatment in order to connect with modern audiences, and it came at a time when Hollywood was ever so eager to create one. And with Fairbanks’ guidance, Robin Hood entered the twentieth century in a big way. 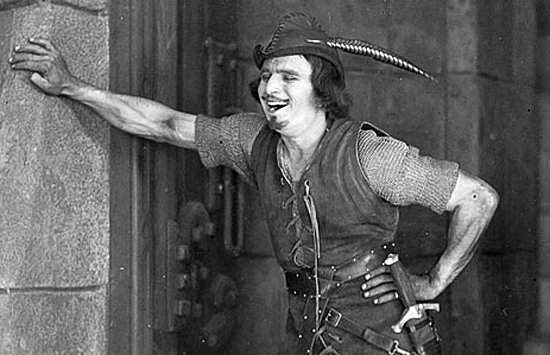 After the introduction of sound and color to the film medium, Hollywood again saw the opportunity to once again bring Robin Hood back to the big screen. And the result is this now classic version, which some often cite as being perhaps the greatest screen version of the story ever. And that’s hard to argue. This beautifully crafted, Technicolor marvel is everything you want a Robin Hood movie to be. It’s got adventure and romance, but also a surprising bit of political subtext. The movie was directed by Michael Curtiz, an Jewish Hungarian filmmaker who fled Nazi occupation of his homeland at the start of WWII by fleeing to America and finding work in Hollywood. This story about suppression of people based on their ethnicity probably felt very personal to someone like him. But, that’s not to say that this movie is just a product of it’s time; it’s actually quite timeless. And a large part of the film’s success is due to the casting of Errol Flynn as Robin Hood. He exudes charisma throughout the movie and commands every scene. Where Fairbanks brought out the physicality of the character, Flynn brings out the humanity, displaying the character’s intelligence and open heart in a very effective way. The movie also has him dealing with all three of his main foes, for the only time that I can think of in any version. Of particular note is Sir Guy of Gisbourne (played perfectly by Basil Rathbone), whose final duel with Robin is an iconic scene in it’s own right. Flynn would become the quintessential version of the character for many years, and probably still is today. No other actor before or since has been able to embody all the nobleness and virtue of Robin Hood, which ironically Errol Flynn had very little of in real life. I guess that makes this a truly unexpected performance as a result. With a larger than life hero as popular as Robin Hood, you knew that Disney would eventually take their own stab at the character with an animated film. What was surprising about their version was the way they did it. In Disney’s Robin Hood, the cast is entirely made up of animals playing all the characters. And remarkably, it works. Some of the character choices are pretty obvious (Richard the Lionheart is literally a lion here, as is the villainous Prince John), but some are cleverly unexpected; Prince John’s executioners being vultures for example. But the obvious choice of animal for the titular hero had to be a fox. For such a cunning and deceptive hero, what else could he be? The character is perfectly designed around both aspects of the character; embodying the persona of a fox while still maintaining the traditional image of the hero, complete with green tunic and pointy hat. The voice, provided by British born actor Brian Bedford is also perfectly suited for the character. He commands the same suaveness of Errol Flynn, but has a bit more modern sarcastic sense of humor. I also like the way he hams it up whenever Robin is in disguise; whether it be a gypsy fortune teller or as a feeble beggar, it’s always funny. This version may be quite the departure from the traditional story, but it still does a good job of presenting the character in a heroic and noble way. As far as a Disney-fied version of the classic character, this Robin Hood proved to be a crowd favorite and it’s widely viewed as one of the more popular versions of the story for modern audiences, despite all the modern liberties taken with the story. It’s a clear sign of just how universally effective Robin Hood is as a big screen hero. Here we have a decidedly different take on the character than previous versions. This particular film tells us the life of the hero after his daring exploits have already made him a legend, and thus, shows him trying to cope with his legacy into his later years. This version of Robin Hood is really a deconstruction of the Robin Hood mythos, portraying Robin as a man torn between duty and honor. 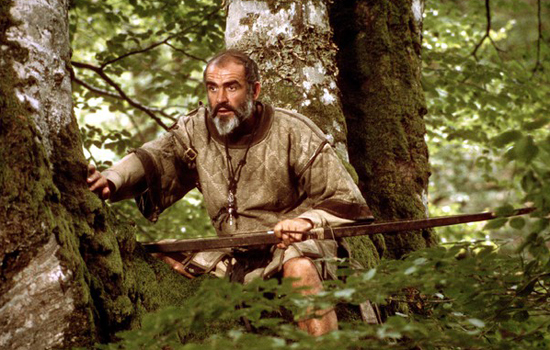 In the movie, Robin (played by Sean Connery) is growing older and he’s seen all the good will that he has brought to the kingdom undone by more war and greed. Richard has again abandoned his throne to fight another Crusade and Robin leaves his king to return home after he becomes disillusioned by the futility of his king’s foolish mission. Upon returning home, Robin seeks to redeem the one thing left in his life that he feels is still within his reach, and that’s his relationship with Marian (played by Audrey Hepburn) who has become a nun in the years since he left. The fact that this movie was made in the wake of the ending of the Vietnam War probably has something to do with this more revisionist take on the character, as society was trying to reevaluate the true makings of heroism and justice. Robin Hood is still pure of heart here, but he begins to doubt his purpose once he’s seen all the good he has done has been for naught. The movie is touching, particularly in the Robin and Marian scenes, but I do have to say that Connery is a bit miscast here. The man is too strong of a persona to play this more vulnerable version of the character. His performance is still good, don’t get me wrong, but I think it’s the least effective representation of what Robin Hood is all about in the end. But, in a future version of the story, we would indeed see Connery much better placed in the world of Robin Hood. For modern audiences, this is probably the version of the character that more quickly comes to mind. This is also one of the more divisive versions of Robin Hood put to film. Many critics balked at the casting of all-American Kevin Costner as the titular hero. The unsubtle approach to the story and characters also made a few people turn their noses up at this version, as well as towards a few other strange film-making choices made by producer Costner and director Kevin Reynolds. But, I do have to say that I consider this movie a bit of a guilty pleasure. Is it a perfect interpretation of the Robin Hood story? Hardly. Taking away Robin Hood’s sense of restoring well-being to the unfortunate and instead making the movie a revenge tale between Robin and the man who killed his father, the Sheriff of Nottingham (a delightfully campy Alan Rickman) is definitely not the way to go to be faithful to the character. But, Prince of Thieves works for me based on it’s own merits as a standalone story. I enjoy the white-knuckle action scenes as well as the beautiful music by Michael Kamen. And even though Kevin Costner’s attempts at a British accent are laughable, he at least has a commanding presence as the character. Can’t say the same about Christian Slater’s painfully bad turn as Will Scarlett. And Costner makes up for his shortcomings by adding charm to the character when needed. Not to mention, he sells that cold stare when firing an arrow at his target perfectly. I also love the addition of Morgan Freeman as a Moorish companion for Robin; something worthwhile that this version added to the mythos. It’s not perfect, but this Robin Hood story still engages me every time I watch it. Also it allowed Sean Connery to find his rightful place in the world of Robin Hood when he cameos at the end as King Richard himself. Now there’s a suitable role for the former 007. Made partially in direct response to the Kevin Costner version of the Robin Hood tale is this spoof movie directed by Mel Brooks. Though Costner’s version is mocked heavily, the movie also takes a fair deal of aim at the classic Errol Flynn version as well. As far as Brooks directed spoofs go, this one isn’t quite as strong as past efforts like Blazing Saddles or Young Frankenstein (both 1974), or even Spaceballs (1987). But, that’s not to say that it’s a bad parody either. There are some jokes that fall flat (the chastity belt gag is a little weak), but others are just as good as anything that Mel Brooks has written before, particularly the subtle ones (I especially love the bit where Robin learns how each of his family members have died since he’s been away, including his pet cat and goldfish). 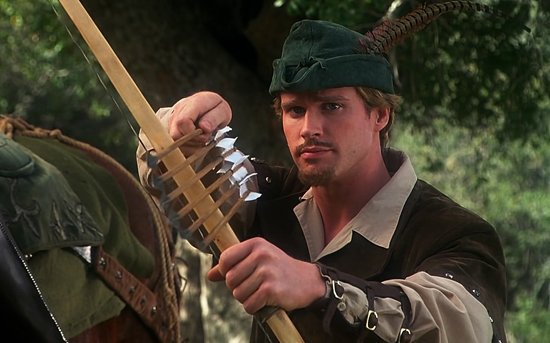 But, the thing that works best in the movie is the casting of Cary Elwes as Robin. Elwes was tailor made for the character, not only looking the part with his Flynn-esque features but also by perfectly displaying the charisma of the character; having come out of playing Dread Pirate Roberts in The Princess Bride (1987) probably helped. I also like the way he brings that out even with all the gags and puns thrown about in the film. There’s a great line in the movie where the English born actor even gets to brag about his role as the character; “Unlike other Robin Hoods, I can speak with an English accent,” which is a not so subtle jab at the American Costner and probably even to the Aussie Flynn. And because of Elwes contribution, this is actually one of the better interpretations of the character we’ve seen on the big screen. It’s funny without betraying what makes the character great in the first place. And it also taught us the important fact that real men wear tights. On paper, this should have been an interesting idea, but sadly the execution left a lot to be desired. 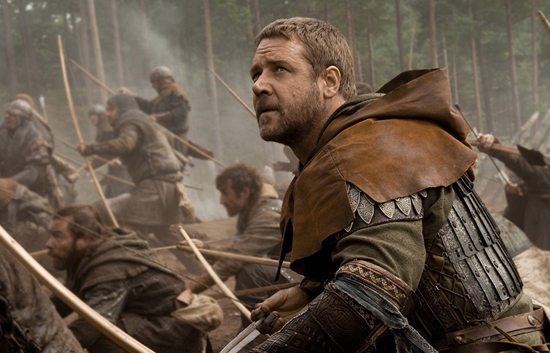 Directed by Ridley Scott and starring his go-to star Russell Crowe, this version of Robin Hood actually deconstructs the origins of the character, showing how he became the Outlaw of Sherwood Forest. Instead of coming from noble lineage, we see Robin rise up from being a lowly archer in King Richard’s army. He decides to flee back to England after Richard is killed in battle, but not before assuming the identity of a dying nobleman by the name of Robert Loxley in order to gain safe passage. Once home, he learns of the growing tensions between nobility and the peasantry, while at the same time trying to gain the trust of the Loxley family that he is now in charge of, including the Maid Marian (Cate Blanchett). At the same time, a plot to help an invading French force is arising, conducted by the villainous Sir Godfrey (Mark Strong). If that seems like a convoluted premise, it is. This version is too bogged down with plot details to work effectively as a Robin Hood story, and sadly what gets sacrificed in the process is character development. Russell Crowe in particular gets nothing to do with the character. It’s almost like Scott and Crowe are just trying to rekindle the same kind of magic that they showed in the far superior Gladiator (2000), but have since forgotten how to do it the same way. It’s an origin story where none is needed. We want to see Robin Hood steal from the rich to give to the poor, but this movie seems less concerned with that aspect then to showing us how Robin got his name. It’s beautifully crafted, but a dull sit through of a story, which is decidedly uncharacteristic of a Robin Hood movie. 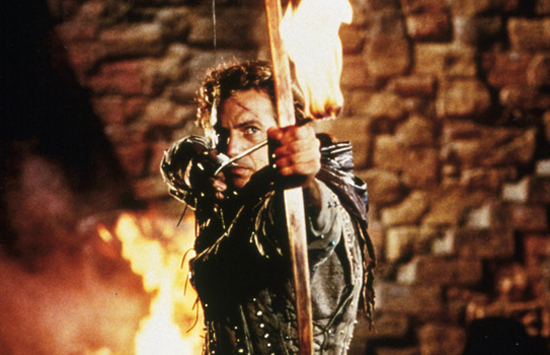 Mostly, this movie just proves to us the wrong way to bring Robin Hood to the big screen. Robin Hood has always remained relevant to audiences of all generations. Everyone knows the tale, whether they’ve seen any of his movies or not, and I guess that’s why so few of these films have actually deviated very far from the traditional plot itself. I think that a large part of his resiliency is because of the timelessness of the character. 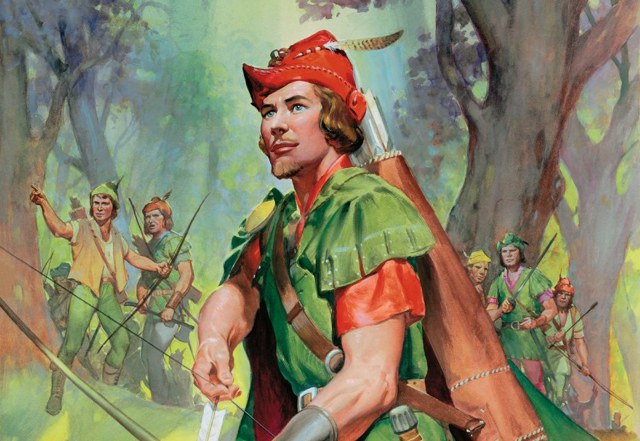 Though medieval in origin, Robin Hood has since become an archetypal hero. His selfless crusading for the underdog has been a favorite character asset that we’ve seen carried over into other respected heroes in film and literature, such as Atticus Finch in To Kill a Mockingbird (1962). The films based on his exploits have also left their mark on modern action and swashbuckling films over the years too. The Adventures of Robin Hood (1939) in particular stands out as an iconic work of film art, and one that definitively establishes Robin Hood’s place in the pantheon of cinematic heroes. Though modern versions of the character have been shaky (particularly the tired Russell Crowe version), he’s still a character that will undoubtedly live on well into the future with more big screen adaptations, and hopefully they’ll continue to add more depth to his hero’s journey. If there is one thing that all these different versions have shown us is that the story continues to evolve. That’s the special thing about heroic tales in folklore; they continue to grow the more you share them and add your own special twists. And in that respect, Robin Hood has grown more as a character on the cinematic screen than he has in many centuries before in literature, making him a truly modern hero.